The WikiLeaks Party believes that truthful, accurate, factual information is the foundation of democracy and is essential to the protection of human rights and freedoms. Where the truth is suppressed or distorted, corruption and injustice flourish. The WikiLeaks Party insists on transparency of government information and action, so that these may be evaluated using all the available facts. With transparency comes accountability, and it is only when those in positions of power are held accountable for their actions, that all Australians have the possibility of justice. The WikiLeaks Party is fearless in its pursuit of truth and good governance, regardless of which party is in power. In each and every aspect of government we will strive to achieve transparency, accountability and justice. This is our core platform. 3) To scrutinise and oversee government practice, honesty and efficiency (the oversight function). However what we have witnessed in Australia, despite exceptional work by individual politicians in all the major parties, is a failure of the oversight function. There has been a gradual acceptance that once a single party or a coalition has gained the majority required to form a government, Parliament then becomes little more than an extension of that government’s executive machinery: the houses of Parliament effectively become rubber stamps for its policy agendas. This problem becomes particularly pressing when a single party gains a majority in both Houses, a spectre that remains a distinct possibility after each federal election. 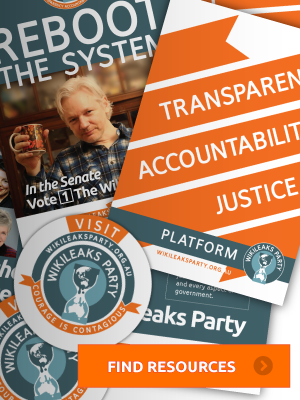 The WikiLeaks Party aims to restore genuine independent scrutiny into our political process. This is why we are campaigning only for the Upper House. We want to return the Senate to its core function as a genuine Upper House – offering independent scrutiny of government, protecting the interests of the people, and ensuring that light is shone upon bad practices. Parliament is also failing Australians in its democratic function. In a true democracy, Parliament must facilitate – not obstruct – our democratic obligation to dissent. Yet we are witness to a degeneration of democracy into political party oligarchy, in which dissent is stifled and the public bureaucracy is contained and docile. Members of Parliament fail to represent the people who elect them partly because of the party system: they are constrained by an obligation to toe their party line. Instead of voting according to conscience or according to the values they have publicly espoused to their constituents, they vote as they are instructed by their Party leadership. Far too often politicians conceive their public role not to be scrutineers of government, but to be partisan supporters of their own party. Their sense of duty to the party and to the networks of political patronage to which they owe their nomination and their career prospects, outweighs their sense of duty to the electorate. How rare is it to see a Member of Parliament, whether in government or in opposition, stepping out of line, or raising difficult or controversial issues? To engage in backbench rebellion spells death for the career politician, putting an end to their prospects of career advancement or ministerial appointment. The result is a system of party oligarchy in which conspiracy and corruption of purpose flourish. It’s time for a culture shift. It’s time to give dissidents a voice in our political system. It’s time to inject some genuine, independent scrutiny into our political process. The WikiLeaks Party will run candidates in future Australian Senate elections. Our Senators will be genuinely independent in their scrutiny of the government and demand thorough transparency its contractual arrangements with private companies. We will bring our core principles of transparency, accountability and justice to bear on all the major issues currently facing Australia. WikiLeaks Party candidates are ideally suited to the work of the Senate: they are skilled in understanding complexity and they are experienced in dealing with large amounts of documents produced by bureaucracies and spotting their hidden significance and tricks. The WikiLeaks Party will be vigilant against corruption in all its forms. The WikiLeaks organisation was pioneering in its use of ‘scientific journalism’, reporting information with reference to publicly available primary sources. The WikiLeaks Party will promote ‘scientific policy’; decision-making based on research, evidence and clear, transparent principles. the free flow of information: we live in a media-ocracy. What is politically possible is defined by the media environment. And in Australia 98% of the print media is the hands of just three corporations. Seven out of ten of our national newspapers are owned by the Murdoch News International group. The WikiLeaks Party will push for radical change in media policy to increase Australian media innovation. Internet freedom – the WikiLeaks Party will be fearless in its opposition to the creeping surveillance state, driven by globalised data collection and spying agencies, both state and corporate controlled. We will demand that all information on data seizure and storage of citizens’ data by government agencies and allied corporations be made public. protection for whistleblowers – with an increasingly unaccountable corporate state and an increasingly secretive security state, whistleblowers are an essential brake on bad practice. Only the threat of leaks can keep unaccountable institutions honest. So whistleblowers must be protected by law. standing up for national sovereignty – for too long Australian politics has been under the influence of foreign powers and transnational non-state actors, affecting both our foreign and domestic policy, against the interests of Australians. The WikiLeaks Party will fight to expose the collusions between the Australian state and the military-industrial complex that dominates world affairs. integrity in the global community – our national character is proud and generous, but recent policies have not met our obligations to the international community. 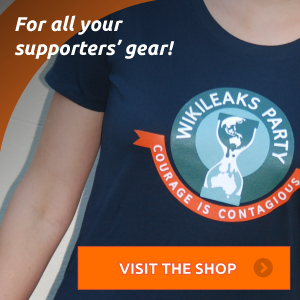 The WikiLeaks Party will ensure Australia stands tall as a responsible global citizen.